The Budapest Sound Collective has been operating since 2013 as a projects ensemble. 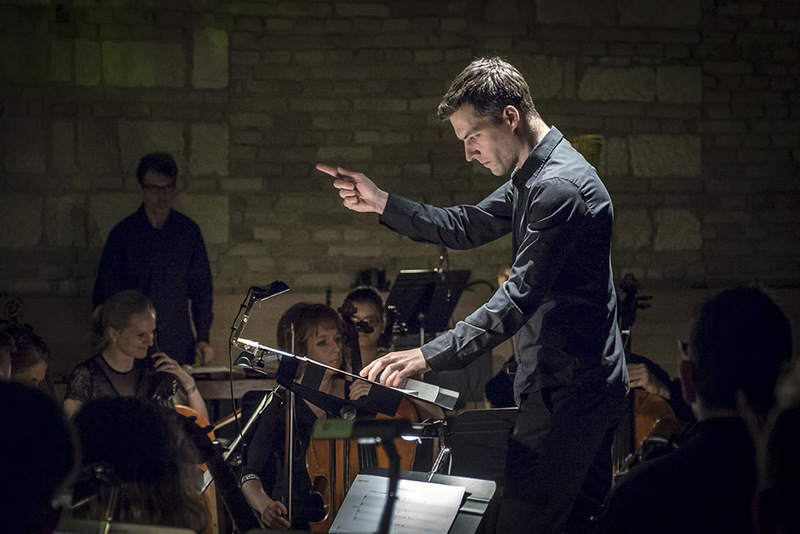 Its artistic director and conductor is Gergely Dubóczky, who established it to carry out his ideas on experimental avant garde formations in search of new forms. His aim is to perform contemporary and classical music with a new kind of approach, involving on occasion other branches of the arts. At the centre of the Budapest Sound Collective’s series of concerts entitled Elements lie the physical properties of sound, like for example volume or timbre. The opening concert explored the connection between sound and space, seeking to find how sound is influenced by its spatial surroundings, and how sound creates the illusion of varying spaces. The works featured in the concert programme were joined by Prague Modern’s prize-winning installation Listening Eyes: Enter the Sound, Hear the Space. The second item in the series guided the audience around the world of sounds and colours with the aim of them experiencing a new dimension of the feeling and understanding of pieces of music. Following a strict dramaturgy, an ever richer range of timbres was created from a few basic timbres – namely certain types of timbre (for example strings, percussion, wind) – producing ever complex combinations. During the concert the musical procedures took place in parallel with the setting up of Csaba Antal’s planned installation entitled Spectrumator which creates increasingly complex images of colour. Haydn’s The Seven Last Words of Christ on the Cross (Die sieben letztenWorte unseres Erlösers am Kreuze) was originally performed together with homilies given by the Bishop of Cadiz for each of the seven words as part of the Easter liturgy. In 2014 following an idea by Gergely Dubóczky and conducted by him, the Budapest Sound Collective gave the first performance of Haydn’s Seven Last Words with texts written by Péter Esterházy for insertion in place of the seven homilies. This powerful prose was added to Haydn’s music by the voices of two actors, a man and a woman. The resulting work inspired a series of seven paintings by István Nádler which in 2017 were seen by the audience in another performance that brought into a created unity music, words and pictures.